On Saturday Fred and I set out to do some hiking, with no definite destination in mind. His first choice was Welcome Pass but I talked him into doing the Keep Cool trail because it was going to be a very warm day (by Pacific Northwest standards) and I was afraid that there might not be any water on Welcome. Why do I keep going back to that Keep Cool trail? The forest service orphaned it about ten years ago and built a new trail to Yellow Aster Butte that takes off from the venerable old Tomyhoi Lake trail just before it reaches Gold Run Pass. I doubt if Keep Cool was ever a very good trail and a decade without any organized maintenance has not been kind. The lower reaches are nearly overgrown with brush, there are numerous fallen trees to cross (some as much as three feet in diameter), some segments are cruelly steep. Or rocky. Or wet. Or all three. I think it is just this desolation that brings me back – in addition to my deep-seated contrarian streak, you don’t have to worry about running into crowds on the weekends. The isolation was not perfect this time as we were over taken at one point by a younger, fast-moving hiker who couldn’t see why the FS had closed this trail, as it is just to his liking. He added some sharp remarks about all the sissy trails in the area with “4% grades” before he disappeared into the trees. Later as we were squeezing through a particularly narrow spot on the trail I commented to Fred that he probably likes it because it fits his mind so well. Enough snarkiness. 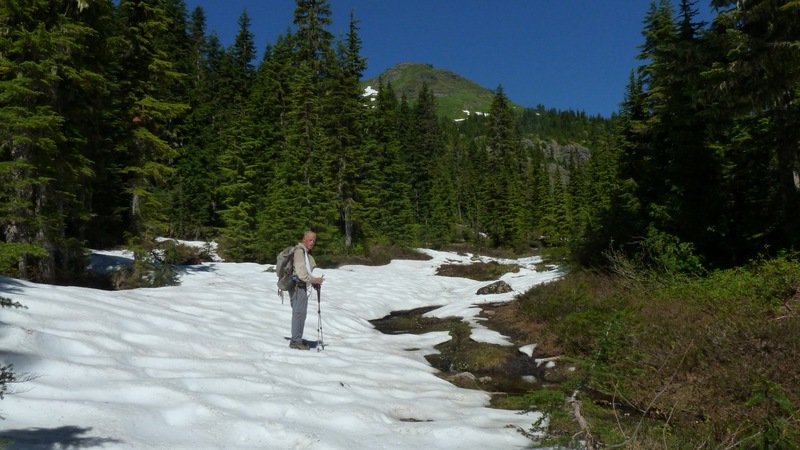 When we got to the wet meadow at about 4700′, where we were stopped by the snow the last three times we’d tried this trail, I was somewhat surprised to see it still covered in snow. The ground shows through in many places and the snow is soft and easy to walk on, but snow always makes the going a bit tougher – those times where your foot doesn’t stay where you put it eat up a lot of energy. 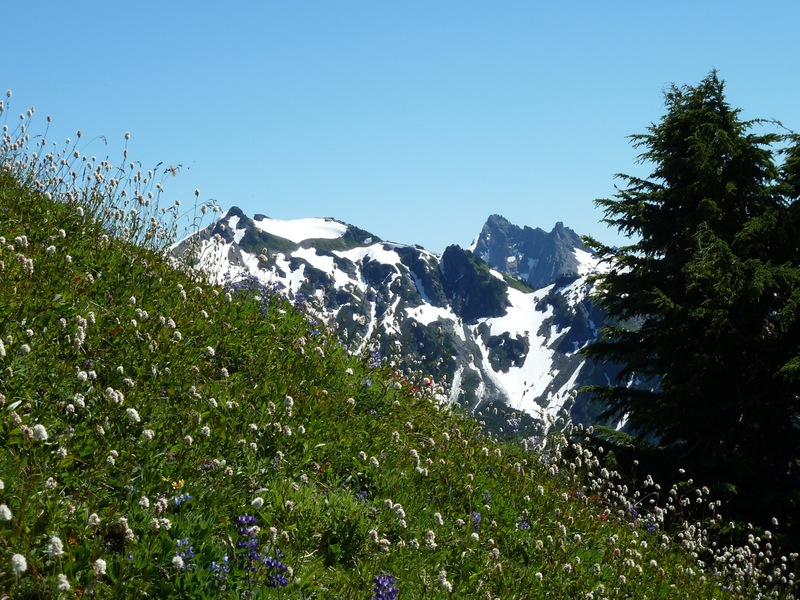 But you can see in the photo that Yellow Aster Butte, in the background, is almost free of snow. And the steep slope on the far side of the meadow where the trail continues on up to the series of small lakes below the Butte looked dry as a bone, so we eagerly hustled across the level area and started climbing again. Fred was coming down with a pretty serious case of summit fever as we looked across at Yellow Aster Butte. 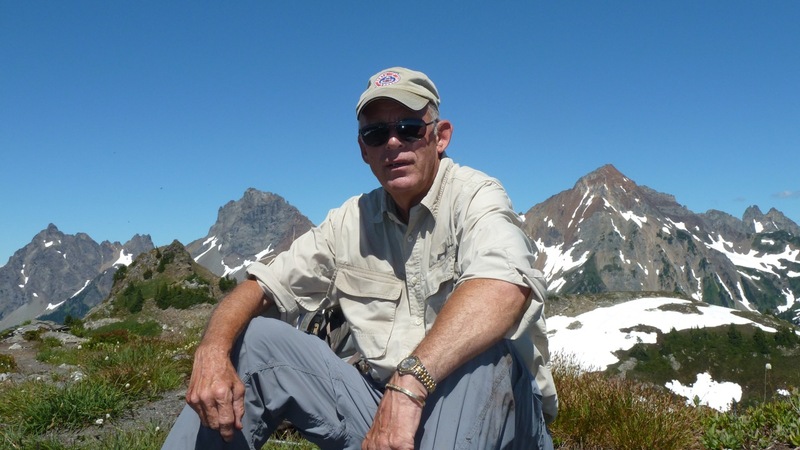 My goal had been more modest – taking a left turn over toward High Divide and climbing an prominent unnamed peak that I am calling Black Rock Butte today. 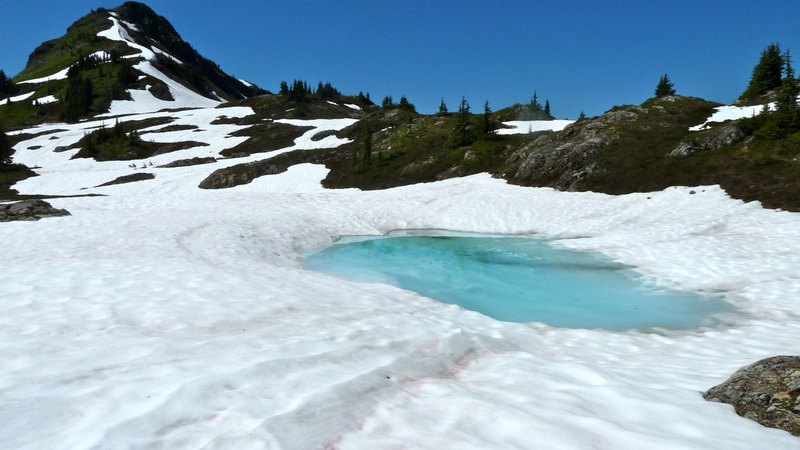 As we got a better look over that way we could see a big streak of snow heading right up where the “trail” goes; on the other hand Yellow Aster, while further away across the ice-covered tarns, looked almost free of snow. And we could see a few hikers traversing the new trail and even caught sight of one person almost at the summit. The trek through the snow among the tarns really wore me out. The area looks fairly level when you are looking down on it from almost 1000 feet above on the summit, but it is really quite bumpy. By the time I had dragged myself up the steep (I use that word a lot) set of a dozen switchbacks that leads to the new Yellow Aster trail, I was pooped. Fred headed on up the last quarter mile that climbs 400′ to the summit (Ha! I didn’t say “steep”. Oh, wait. Darn.) and I sat down and ate everything in my pack that was even remotely digestible. I also drank the last of the liter of water that I had brought from home. Feeling restored, I parked my pack under a nearby tree and began to shuffle up the trail. 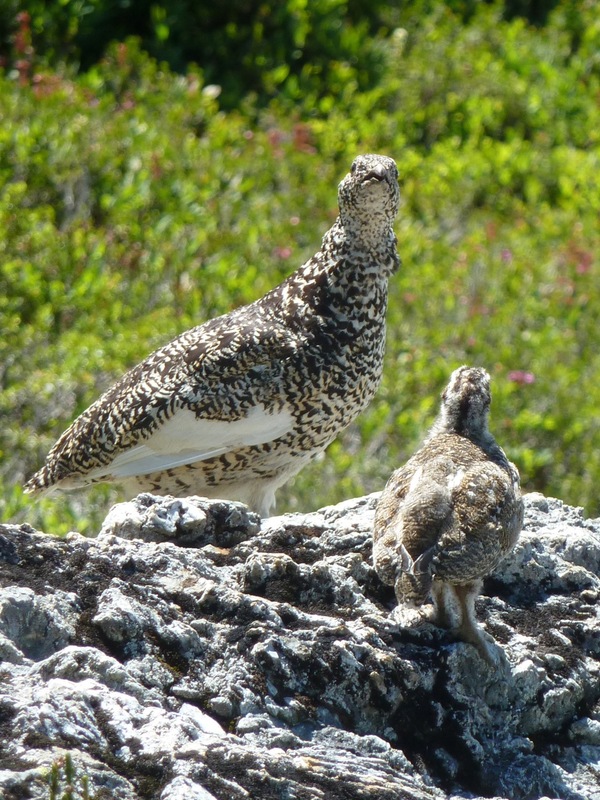 I was quickly rewarded with a cheeping sound as a little Ptarmigan chick popped onto a rock about 10 feet away. Then another and another. And then Mama caught up. The chicks were scampering around, climbing onto and falling off of rocks, and paying no attention to me at all. Mama, however, kept a close eye on me as she tried to manage the exuberance she had hatched. These birds are paragons of the concept of “protective coloration”. They almost completely disappeared when they were on the rocks and, more surprisingly, blended into the foliage, too. In winter they up their act by turning snow white. We had a direct view of the Mount Baker Ski Area and its cell phone tower, so we each made a call to let our wives know that we would be late. It was already after 2:00 – it had taken us (i.e., me) almost five hours to get here and, given the snow and the steepness, it would not be a cakewalk getting back down. When I checked the track log on my GPS we were both shocked and amazed to learn that we had gone not quite 4 miles! It is normal for me to pooped and sweating like cold beer in Georgia after 4 miles, but even Fred was feeling this one. How could it have taken us 5 hours to go 4 miles? I had brought my water filter/pump so as soon as we got back down to the tarns I pumped a liter of fresh cold water into my hydration tank, and pumped a liter for Fred as well. The trip back went a little quicker but it still took 3.5 hours to go those measly miles. And we stopped and pumped two more liters when we got to the big stream in the woods. Total for the day: for me, 3 liters; for Fred 5 liters. And I didn’t have to “relieve myself” until I got back to Bellingham and had drunk all the water in the car and a 20-ounce Dr. Pepper. I stitched up this panorama taken just below the summit to show the perfect weather. Mount Rainier was barely visible in the distance between Shuksan and Baker, but this picture doesn’t show it. To the right of Baker is Black Rock Butte and High Divide.